Mark Bould and China Miéville, eds. Red Planets: Marxism and Science Fiction. Wesleyan UP, 2009. In 1972, Darko Suvin published “On the Poetics of the Science Fiction Genre”, where he announced science fiction’s importance as “the literature of cognitive estrangement” (372). “SF,” Suvin writes, “is then a literary genre whose necessary and sufficient conditions are the presence and interaction of estrangement and cognition, and whose main formal device is an imaginative framework alternative to the author's empirical environment” (375). Suvin’s definition of SF, a genre of fiction which is “wiser than the world it speaks to,” is famously exclusionist; not only are fantasy and the fairy tale anathematic to the high cognitive ambitions of SF, but—by his own estimate—95% of what is published as SF does not deserve the name either (381). Suvin foregrounds his indebtedness to both Viktor Shklovsky’s ostranie and the famous Verfremdungseffekt of Bertolt Brecht, and notes in passing that SF (as a “fundamentally subversive genre” ) has a great deal in common with the classic pastoral, whose “imaginary framework of a world without money economy, state apparatus, and depersonalizing urbanization” stands in relationship to SF “as alchemy does to chemistry and nuclear physics: an early try in the right direction with insufficient sophistication” (376). Though the words “Marx” and “Marxism” appear nowhere in Suvin’s essay, the necessary political orientation of both SF and its audience is unmistakable. In his introduction to Red Planets: Marxism and Science Fiction, Mark Bould describes “the Suvin event”—his publication of “Poetics” combined with his founding of the journal Science Fiction Studies with R.D. Mullen in 1973—as the foundation for all subsequent SF theory (18). (The SF-flavored image Bould chooses to characterize Suvin’s influence is a black hole, whose event horizon one might choose either to inhabit or attempt to escape, but around which one will always be in orbit.) Bould and his co-editor, writer and critic China Miéville, had earlier considered “the Suvin event” in a special issue of Historical Materialism they co-edited in 2002 devoted to the question of “Marxism and Fantasy,” where each argued that the Suvinian prohibition on fantasy should finally be lifted on the grounds that (for Miéville) “‘real’ life under capitalism is a fantasy” of commodity fetishism (41-42) and (for Bould) that “the very fantasy of fantasy as a mode … gives it space for a hard-headed critical consciousness of capitalist subjectivity” (83-84). Red Planets continues this critical trajectory with important interrogations of other aspects of the Marxist approach to SF articulated by Suvin and by the well-known theorist of Marxism and SF most often associated with Suvin’s approach, Fredric Jameson. For decades, Jameson has focused Suvin’s “cognitive estrangement” around what he calls “the desire called Utopia”: our attempts to imagine and shape big-H History by recasting the present as the fixed historical past of some projective future. Where Suvin and Jameson privilege the supposed rationalism of SF over other modes of fantasy, then, Miéville argues they are often doing so purely on the grounds of the genre’s ideologically infused “scientific pretensions” (241). What is most needed in SF theory, then, is for Miéville not further elaboration upon so-called cognition (i.e., pseudoscience), but rather a theory of alterity as such that can account not only for the differences between SF and fantasy but also for possible unrealities beyond the utopic (243-244). Other essays make similar theoretical moves. Darren Jorgensen imagines a kind of alternate history for SF theory in which it was dominated not by Jamesonian Marxism but by Althusser; in this approach, “SF is not so much a Suvinian cognitive estrangement as an identification with revolutionary possibility, producing the consciousness of the absolute difference that creates it” (208). This, he suggests, would be a good corrective for the Western Marxist tradition as a whole, for which (shackled by the failures of 1968) “the revolution might just as well be SF, belonging as it does to the imagination of some speculative future” (207-208). For Andrew Milner, it is a return to Raymond Williams that is needed, particularly his insistence on the specificity of SF as a genre distinct from utopian writing rather than one that is coextensive with it. For his part, John Rieder notes that in SF cinema at least, the operative mode of SF spectacle is not Brechtian estrangement but rather absorption, and shows, through a reading of the three “cuts” of Wim Wenders’ Until the End of the World (1991), that SF often bears less the imprimatur of cognition than the scars of a particularly fraught relationship with market forces. In his introduction to the book, Marc Bould begins with Jameson, specifically with Jameson’s characterization of cyberpunk as a manifestation of globalization’s “geopolitical imaginary.” Bould argues that SF has mapped the flows of capital as far back as Verne’s stories about Captain Nemo and the fantasy of unrestricted circulation of international capital that is his Nautilus: “SF world-building,” Bould says, “is typically distinguished from other fictional world-building, whether fantastic or not, by the manner it which it offers, however unintentionally, a snapshot of the structures of capital” (4). But despite this very Jamesonian view of the genre’s potential for cognitive mapping, Bould nonetheless claims that there is no necessary relationship between Marxism and SF, only a contingent one; the Suvin event just happened to happen, in our timeline, but things might easily have been otherwise. It falls to Carl Freedman (a former student of Jameson’s, and the writer who in his 2000 book Critical Theory and Science Fiction is arguably Suvin’s St. Paul: at once his most full-throated disciple and his most ambitious reviser) to make the case for a necessary relationship between Marxism and SF. In his contribution to the collection, Freedman begins by identifying a dialectical disjuncture in Marxist thought between deflationary and inflationary modes of critique. “The deflationary dimension,” he writes, “is represented by the attempt to destroy all illusions necessary or useful to the preservation of class society in general and of capitalism in particular” (Red Planets 72). This can be seen fairly clearly in ideology critique, but also in the more structural discussion of the “secret” of surplus-value in Capital, Vol. 1. Deflation, Freedman suggests, has a certain figurative relationship with noir in prose and film (73-74); while noir does not necessarily produce usable knowledge about the workings of capital, the genre’s preoccupation with individual greed “allegorically gestures towards… the kind of knowledge discoverable through application of Marx’s principle of the ultimately determining role of the economy” (74). It produces a kind of affective intuition that points us in the right direction, so to speak, if not getting us much of the way there. Inflation, by its nature, is much more fragmentary and affective than deflation; inflation is effusive and intangible, a mode of prophecy and dreams. Marx, after all, had famously little to say about what the world would be like after communism, but the utopian impulse towards a liberatory fulfillment of history—Marx called it history’s true beginning, Engels called it “humanity’s leap from the kingdom of necessity to the kingdom of freedom”—is nonetheless always the beating heart at the center of the Marxist project. For Freedman, the genre most closely associated with this utopian impulse is SF, and he goes on to argue that, unlike the case of noir, SF narrative sometimes provides better pictures of the inflationary future than straight expository prose can; because it is impossible to produce concrete knowledge of the future in the same way we can produce it of the present and the past, it is SF (itself a dialectic between deflationary scientific extrapolation and unbound inflationary speculation) that produces our best cognitive maps of potential futures (74). In this way, Freedman seems happy to take Jorgensen’s dare that “the revolution might just as well be SF,” writing that the “visionary, material transcendence” of SF “has, at least since the final lines of The Communist Manifesto, been the ultimate point of Marxism itself” (82). As Freedman puts it, “For Marxism, visionary transcendence is the necessary completion of astringent demystification” (73)—which is to say not only that the dream of liberation arises out of the demystification of the actual, but also that it is only through an accurate, scientific understanding of capitalist reality as it exists that we can begin to imagine plausible alternatives to the actual in the first place (75). (This sort of cognition is, after all, precisely the line that separates communists from Marx’s scorned “utopian socialists,” those mere wishful thinkers…). And this turns out to be exactly where Suvin began: visionary transcendence (estrangement) as the necessary completion of astringent demystification (cognition). Not Marxism and SF, then, but Marxism as SF, and for that matter, SF as Marxism. Of course in making this provocative equivalence we should not overlook the science fictional imagination’s often cozy relationship with capital, colonial violence, racism, and oppression, nor allow ourselves to believe that leftist political commitment might begin or end with reading the novels of Kim Stanley Robinson. But we can, I think, buy Freedman’s basic line: the specificity of SF as the literature of quasi-scientific futurological projection—the literature of cognitive estrangement—gives it a particular and (yes) even necessary relationship with Marxism that cannot be put to one side, nor matched by any other genre. In this way Suvin’s forty-year-old definition of the genre remains in some basic sense both vital and inescapable in mapping SF’s limits and its possibilities. Near the end of his recent Valences of the Dialectic (2009), Fredric Jameson writes along these lines when he claims that “the worldwide triumph of capitalism … secures the priority of Marxism as the ultimate horizon of thought in our time” (605). Marxism here describes the boundaries for our extrapolations and speculations, the theoretical constellation in which we might start to grasp History in its totality and through which the imagination of alternatives to capitalist hegemony is still possible. Such a proposition again suggests Marxism as a science fiction, in that best Suvinian sense. No wonder, then, that the images that close Jameson’s book shortly thereafter turn to the language of speculative physics—one might say science fictional physics—to describe our fleeting ability to catch glimpses of Utopia: “It would be best, perhaps, to think of an alternate world—better to say the alternate world, our alternate world—as one contiguous with ours but without any connection or access to it. Then, from time to time, like a diseased eyeball in which disturbing flashes of light are perceived or like those baroque sunbursts in which rays from another world suddenly break into this one, we are reminded that Utopia exists and that other systems, other spaces, are still possible” (612). For Jameson, there turns out to be nothing beyond the utopic, as Utopia is just another name for alterity; Utopia, like Suvin himself, has a kind of event horizon, and in the end our speculations always pull us back there, like gravity, like home. Bould, Mark, and China Miéville (ed.). “Symposium: Marxism and Fantasy. Historical Materialism 10.4 (2002). Print. —. 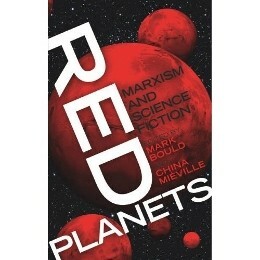 Red Planets: Marxism and Science Fiction. Middletown, CT: Wesleyan University Press, 2009. Print. Engels, Friedrich. Anti-Dühring. Moscow: Progress Publishers, 1947. http://www.marxists.org/archive/marx/works/1877/anti-duhring/ch24.htm. 28 April 2010. Web. Bould, Mark, and China Miéville (ed.). “Symposium: Marxism and Fantasy." Historical Materialism 10.4 (2002). Print. Gerry Canavan is currently a Ph.D. candidate in the Program in Literature at Duke University, writing a dissertation that explores the categories of futurity, totality, and alterity in American and British science fiction of the twentieth century. With Priscilla Wald he is the co-editor of an upcoming issue of American Literature focusing on SF, fantasy, and myth, and is also the co-editor of an upcoming issue of Polygraph titled "Ecology and Ideology."